Padilla is best known for his Miami blend and the year-branded lines that were created while Jose “Don Pepin” Garcia was manufacturing his cigars: Signature 1932, Padilla 1948, and the Serie 68. When Pepin withdrew from the partnership in 2009, the brand names stayed. There is some debate about how much the blends really changed at this point — to me they seem very similar but not exactly the same. In any case I think the new ones are just as good, if not better, than the old ones. 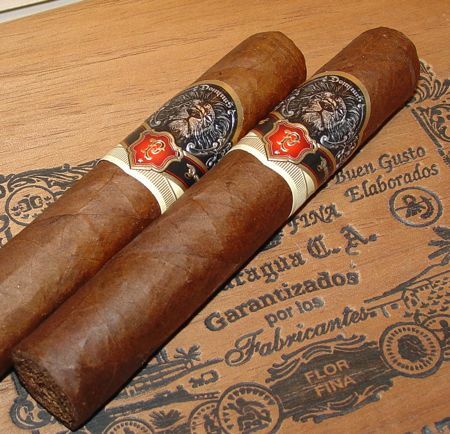 The Dominus line is composed of Cuban seed corojo from the Esteli and Jalapa regions of Nicaragua. The tobacco was harvested in 2007, but is called Corojo 2006 — I’m not sure if that refers to the strain of tobacco or the crop year. The flavors here are clearly Nicaraguan, but I’ll go a bit further out on the limb and say this is Aganorsa — to me, it has that sweet caramel tang that is so characteristic of Aganorsa leaf in Illusione, Casa Fernandez, and the Padilla 32. Whatever it is, it’s good stuff. The Dominus robusto has an oily, dark colorado maduro wrapper. It’s ruddy with a few veins, but very rich in appearance. The cap is wound three to four times and set solidly on the head of the cigar. The roll is compact, almost hard to the touch, which results in a firm but still productive draw. The cigar burns evenly and builds a solid dark ash. The robusto opens with pepper, cedar, and a sweetness on the nose that is typical of Aganorsa leaf. It has a caramel-cocoa sweetness to it, with a whiff of hazelnut. After an inch or so the cigar deepens into leather and the finish lengthens, leaving a peppery aftertaste. It’s bracing, rather than harsh or sharp tasting. The woody notes fade a bit on the palate but the aroma still carries the cedar. At the mid-way point the cigar is medium bodied. The Dominus grows earthier in its last stage. The woody notes get a little darker, turning from cedar to hard wood with a touch of clove. The sweetness on the nose continues, like caramel spiked coffee. The band, which is fairly large, must be removed to reach the final smokeable inch of the cigar. At this point the potency of the blend is apparent. 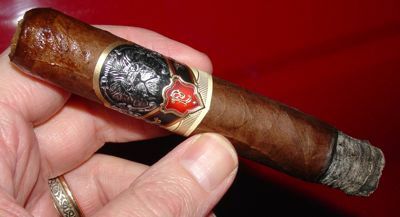 The Padilla Dominus is a very tasty smoke with fine construction values. I’m tempted to say it’s a little earthier, and a little more rambunctious than the Signature 1932 and Miami blends. (If palate memory serves, which it may not.) Regardless, I love the dark woody flavor and sweet edge of this tobacco. And it’s nice to start off the year with a hit. The Dominus is reasonably priced for the quality of the cigar, but it’s still on the high end of the spectrum at around $9 USD for the robusto. At this price it is in competition with several other very good blends in a similar style (Illusione), so we’ll see how it fares over the long run. Adam digs the torpedo for Fire Up That Cigar, but he prefers the 1932. The Perfect Draw gives the robusto a 93. 99 Cigar Guy gets uncharacteristically gushy on the churchill.